When scanning, we aim to develop a foundation of information and inspiration about present and emerging opportunities, challenges, threats relevant to the situation. We use the practice of scanning to build a more robust language, literacy and vocabulary, and to identify emerging sociocultural trends, behaviors and values. 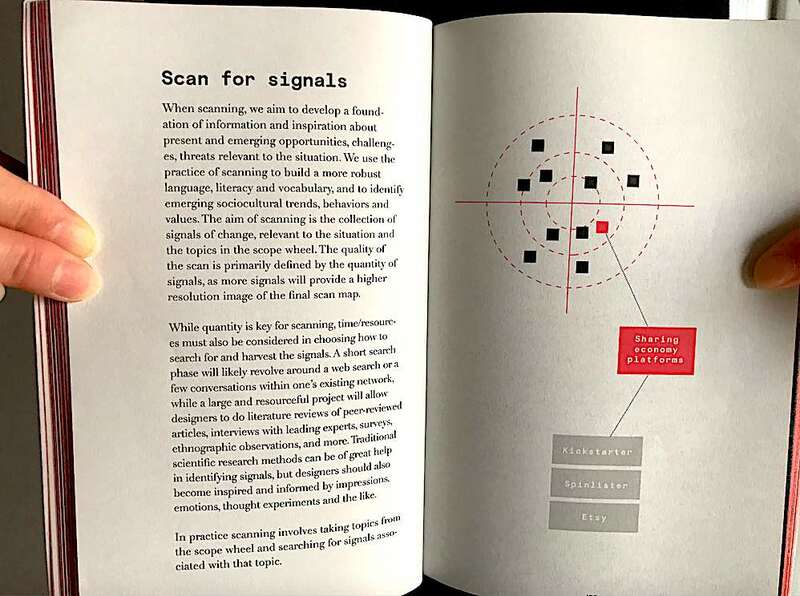 The aim of scanning is the collection of signals of change, relevant to the situation and the topics in the scope wheel. The quality of the scan is primarily defined by the quantity of signals, as more signals will provide a higher resolution image of the final scan map. While quantity is key for scanning, time/resources must also be considered in choosing how to search for and harvest the signals. A short search phase will likely revolve around a web search or a few conversations within one’s existing network, while a large and resourceful project will allow designers to do literature reviews of peer-reviewed articles, interviews with leading experts, surveys, ethnographic observations, and more. Traditional scientific research methods can be of great help in identifying signals, but designers should also become inspired and informed by impressions, emotions, thought experiments and the like. In practice scanning involves taking topics from the scope wheel and searching for signals associated with that topic. Signals are concrete and observable occurrences that show change or the potential of change. Signals make up the data that creates the foundation of information and inspiration for the further design process. 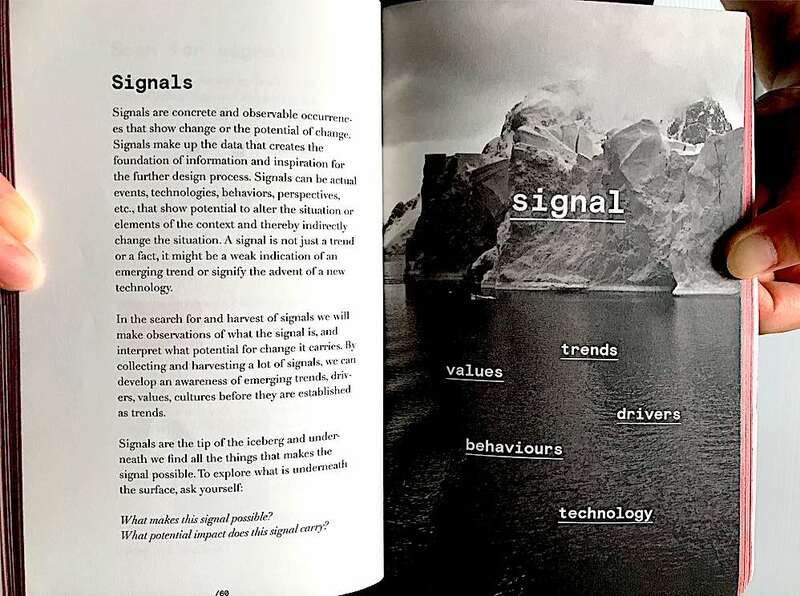 Signals can be actual event, technologies, behaviors, perspectives, etc., that show potential to alter the situation or elements of the context and thereby indirectly change the situation. A signal is not just a trend or a fact, it might be a weak indication of an emerging trend or signify the advent of a new technology. In the search for and harvest of signals we will make observations of what the signal is, and interpret what potential for change it carries. By collecting and harvesting a lot of signals, we can develop an awareness of emerging trends, drivers, values, cultures before they are established as trends. What makes this signal possible? What potential impact does this signal carry? We use notes, pictures and visual memories to help us remember and use the signals in the further process. Sticky notes are a very useful tool in many creative processes, but often we need a more comprehensive format to document and share signals over time, and use them in meaningful ways in a collective setting. 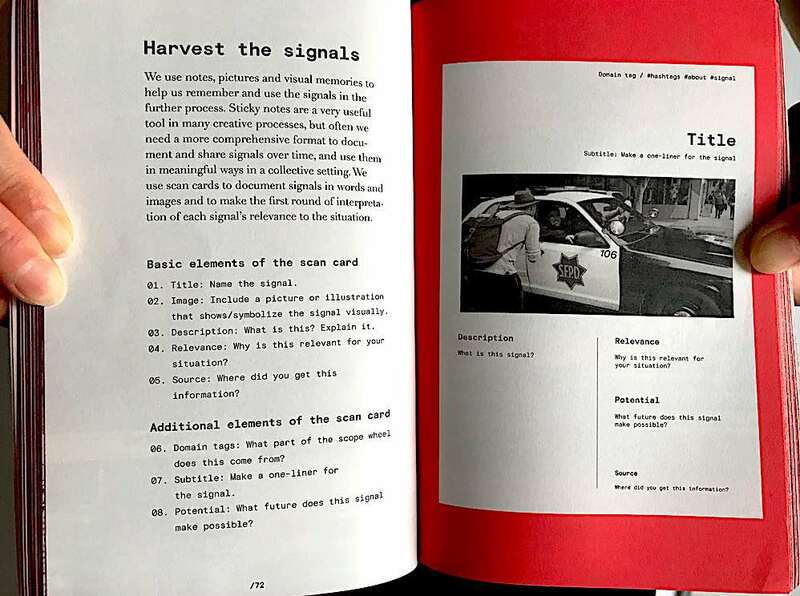 We use scan cards to document signals in words and images and to make the first round of interpretation of each signal’s relevance to the situation. 01. Title: Name the signal. 02. Image: Include a picture or illustration that shows/symbolize the signal visually. 03. Description: What is this? Explain it. 04. Relevance: Why is this relevant for your situation? 05. Source: Where did you get this information. 06. Domain tags: What part of the scope wheel does this come from? 07. Subtitle: Make a one-liner for the signal. 08. Potential: What future does this signal make possible?